Share the post "Interview: 10Q’s with THE FIERCE & THE DEAD"
Matt – We’ve just had the Spooky Action album come out and that’s gone down really well which is great and we’re playing a few gigs around the UK in 2014, we’re doing Eppyfest and Celebr8 and some other ones. We’re doing Stabbing A Dead Horse 2 at the Barfly in Camden with Knifeworld and Trojan Horse, that’ll be fun. I’ve also just made a solo album for Esoteric that’ll be out in 2014 with people like Jem Godfrey, Pat Mastelotto, some of the guys from Knifeworld, my friend Lorenzo and and many other talented people. I’m very lucky. Kev – We’re currently planning for next year. 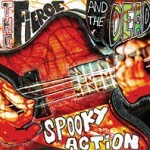 Spooky Action, the new album is out and we’ll be touring it in the new year. And we’ve already started writing for album no.3. Matt – It was written between Sept 2012 to May 2013, we were listening to all sorts Television, Mahavishnu and all that. It’s about absent friends, quantum physics and stuff that is relevant to probably only the four of us. Kev – I think it’s a pretty good indication of where we are at. The first album and the subsequent e.p., they always felt like we were heading towards something. On Spooky Action I think we’ve found it. The way the album was recorded was quite different too. We set up camp in a residential studio for a few days, so we lived together as we made the album. I think that helped a lot as well. 3. The new album is very good indeed and a breath of fresh air to all the vocal albums out there. On the album how do you create the guitar sounds and have the band ever used keyboards, which are a key part to many instrumental only artists. Matt – Thanks very much. Nah we don’t use a lot of keyboards, none live and the odd bit of synth on the records. Mostly the ambient pad noises people think are keys are guitars, I fade loops in using a volume pedal so there is no attack so you get that ambient around. Kev – I like to see how much we can make guitars sound like something else. Unusual combinations of effects pedals, distinct chord voicings, anything that creates a sound I haven’t heard before. We sometimes use pedals, such as guitar synth pedals, that have quite unpredictable results, you kind of have to fight to retain control, but that means you’re always getting something exciting. Everyone has heard a Marshall turned up to 10. I find that kind of thing quite dull, I’d rather hear something that isn’t technically perfect but is new. 4. Is it harder to market instrumental music to fans and to get airplay on radio stations/online? Matt – Yeah, especially as people expect solos and no tunes. We’re very lucky to have an audience, I would like to get our stuff on film soundtracks or more into the mainstream but I think we’re very lucky to have an audience. It’s not what people expect but if they give it a chance then it works. Most of the time. Kev – Some people do seem to have to re adjust their perceptions of music when there is no vocals. They do seem to give vocal led music an accessibility that many assume instrumental music doesn’t have. However we’ve discovered that once people get past that hang up they find our music pretty easy to get into. We’re a very inclusive band, we’re not out to try to alienate people. 5. What have been the live highlights to date and why? Matt – For me it was the Stabbing A Dead Horse tour in 2012 for live with our friends Knifeworld and Trojan Horse, that was an amazing experience, especially the London gig. Kev – Yes, selling out the last date of the Stabbing A Dead Horse Tour felt pretty special. It was great to play in front of an audience who ‘got’ what it is that we do. 6. With your solo work do you have a set plan how each album will sound or does it evolve more organically from a couple of musical ideas? Matt – Umm depends. The first three were pretty much just jamming on the riffs, the new solo one that’s out in March (Lucid) is more of a response to a difficult period in my life. I had a bit of a dark period, I don’t want to dwell on that but I don’t think I’d want to make an album like that again. But I love the record and yeah there was a bit of a plan, there had to be to get the guests in. 7. How important is social media like Facebook, Twitter etc for the band in getting your music out there and communicating with your fans? Matt – It helps, but it’s not the whole picture. It’s a multitude of things, mailing list, social, press, radio, podcasts and all these things, anything to get the music out there. I really like talking to the audience and have made a lot of friends that way. The support of the audience is the important thing. Kev – It’s important, yes, but good old fashioned word of mouth is still a powerful asset. A good live show will help spread the word just as much as a Facebook ad. 8. You use YouTube to get your music out there. How easy is it to make a video nowadays and does YouTube have an impact in that you see increased interest in the band’s music? Matt – We’re very lucky our mate Ashley Jones is our “video and photos guy” – please look at his Chaos Engineers website. In terms of getting people to listen to it some people won’t listen to instrumental stuff so thats a problem and there is so much music coming out it is really hard to stand out. It makes a difference if people share the music on Facebook and Twitter and all that and I’m very grateful for that. Kev – Getting people to listen to it on YouTube? There is so much stuff out there now that to get anyone to listen to your music requires a lot of hard work to publicise and a lot of luck. 9. What made you want to start making music and who have been your major musical influences and why? Matt – I started as a kid wanting to be Megadeth or Voivod and then we got into stuff like Dead Kennedys, King Crimson, Carcass, Jellyfish, Mahavishnu and Talking Heads. We’re all pretty open minded. Kev – It was an outlet that combined a lot of my interests. It is creative and also bound up in science. That’s always appealed to me. Influences have come and gone but i’d say that things like Black Flag, Faith No More, Minutemen, Grace Jones and Talking Heads have always been around. Not a particularly straight forward mix but you can takes things from one context and put them into your own to create something new. Matt – If you like our music please tell your friends about us, it makes a massive difference. And thank you for your support. Kev – It makes a massive difference when we see people coming out to our shows. We are all so grateful that we get to do this, and we really appreciate all of the support. This entry was posted in All Posts, INTERVIEWS, Interviews/10 Questions and tagged ber 2013, Dece, instrumental, interview, Matt Stevens, progressive music, rock, The Fierce & The Dead. Bookmark the permalink.